PHILADELPHIA — They still call him “The Chicken Man,” even though it has been years since Brian Jenkins first served chicken and macaroni on the corner of 16th Street and the Benjamin Franklin Parkway, acting on an impulse he can only explain as God’s will to feed the homeless wandering through Philadelphia’s Center City. These days, his menu looks a little different. As volunteers from a local church scurry through the dimly lit dining hall, loading up long serving tables with trays of meatballs and buttered noodles, corn, salad and dinner rolls, Jenkins glances at his watch. The doors will open in exactly half an hour, but even on a night as cold as this, Jenkins knows the line outside is already wrapped around the corner as men and women wait for the one meal they are guaranteed to have that day. He instructs two volunteers to stand by the door and count people as they come in. The building can only hold 170 at a time. 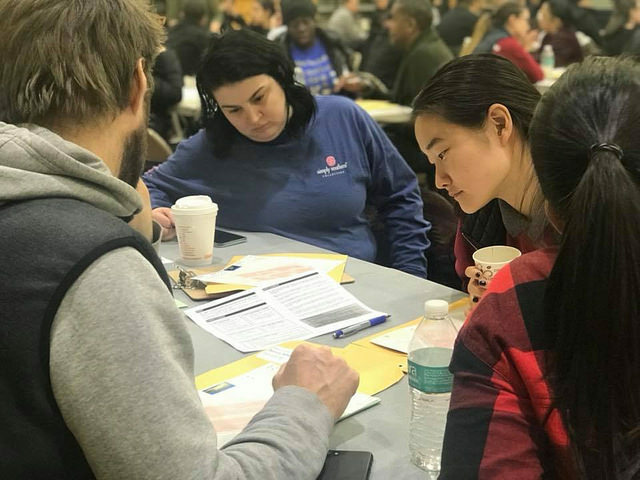 As Americans continue to feel the lingering impact of a crippling recession, cities across the country are experiencing a significant increase in the number of homeless families and individuals overwhelming shelters and taking to the streets. The National Alliance to End Homelessness estimates that on any given night almost 700,000 men, women and children are without a home in the United States. That number is expected to grow. While some cities such as Boston and Washington, D.C., have reported increases as high as 20 percent in the number of families seeking assistance, Philadelphia has emerged as somewhat of a success story. A count by the U.S. Department of Housing and Urban Development shows that the city’s homeless population rose only one percent between 2008 and 2009, with 10 percent fewer people living on the streets today than two years ago. But for the 3,000 people still flooding the city’s shelters, statistics don’t mean much. Herb Wilson can’t find the dime he picked up on the corner of Broad and Buttonwood streets. Wilson’s mornings are never easy, but this one has been particularly frustrating. After showing up at the Ridge Avenue men’s shelter at 2 a.m. intoxicated, Wilson was thrown out at 5:45 a.m., forced back out into the blistering cold to face a city set on averting its eyes. Wilson’s plan for the day is to find food. Later, he’ll try to look for a warm place to sleep — he only needs five hours or so. Standing outside the Philadelphia School District building on Broad Street, Wilson begins to panhandle. It is a routine he has perfected after living on and off the streets for the past ten years. He refuses to beg, relying instead on humor to coax spare change from the pockets of passerby. Wilson said he sometimes lives with his aunt in the city but feels bad freeloading and leaves when money is too tight. He used to have his fork lifters’ license but got laid off from his job in construction cleanup. He hasn’t been able to find work since. It is a question shelters and outreach programs are scrambling to answer. Laura Weinbaum, director of public policy at Project H.O.M.E, an advocacy group for the city’s homeless, said despite current statistics, it is only a matter of time before Philadelphia’s homelessness problem escalates. Already, she said, shelters and temporary housing sites are running at full capacity. Project H.O.M.E counted around 400 people living on the street during its last census report, a number Weinbaum said is higher than average for fall. Weinbaum said the city’s comparatively low cost of living has allowed some families to live off of savings, at least for a little while. In 2009, Philadelphia received more than $21 million in stimulus money to provide housing for 300 families and 200 individuals struggling to stay off the street. But now the city is running out of resources, and affordable housing is becoming increasingly harder to find, especially for families. But there are also the single mothers who have no other option but to live in cheap motel rooms with their children, placed there by the city because there are no spots available anywhere else. And there are the growing number of people over 65 who, often disabled, find themselves stuck in shelters, unable to work or live by themselves, as well as middle-aged men like Wilson, who circulate from shelter to shelter, collecting welfare and little else. At Our Brothers’ Place, a men’s shelter on Hamilton Street run by the Bethesda Project, shelter director Robert Hayes knows just how varied the faces of homelessness can be. Since coming to the shelter seven years ago, Hayes has seen hundreds of men come and go, some of them landing on their feet, some of them reverting to the streets. With one in 10 men getting into subsidized housing, Hayes said success is often hard to measure. Self-sufficiency, Hayes said, is ultimately the goal for those who come through the shelter. Our Brothers’ Place can house 150 men at a time, with the average stay lasting around 100 days. During that period, men are provided assistance searching for jobs, applying for Social Security and finding housing. The shelter used to employ seven social workers and a dayroom staff to overlook the needs and activities of residents. But today, Our Brothers’ Place only receives enough money from the city to fund three basic referral workers. Hayes fears more cuts are still to come. But Hayes doesn’t have time to think about budget cuts. Like Weinbaum, he is preparing for Philadelphia’s homeless population to rise, and soon. At Chosen 300, the doors have opened and The Chicken Man watches as the first wave of guests race to grab a seat at one of the 10 long tables filling the dining hall. Some know each other, waving from across the crowded room, Wednesday night regulars. Others sit silently, their heads down and arms folded. A volunteer pushes a garbage bin full of Diet Coke around to each table, handing out one can per person. Servers have only just started to pass around paper plates piled with steaming meatballs and gravy, but Jenkins is already thinking ahead. It is 31 degrees outside, and the city has issued a cold weather emergency alert, “Code Blue.” Jenkins has to get everyone out by 7:30 p.m. so they can be back in shelters by 8 p.m. Otherwise they might lose their beds for the night. An outreach team stands ready to assist those who have nowhere to go. 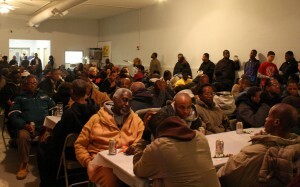 A final tally shows that 230 people have been fed that evening — a “light night” by Jenkins’ standards. Jenkins said he does not know what to expect in the future — only that he will continue to live up to his name, The Chicken Man, giving temporary relief to those who need it most. And for the 230 who walk through his door, temporary is better than nothing at all.